Poor Karl. You’ve gotta feel for him. Moving on from his nondescript but possibly 9 percent ABV DIPA-fuelled request for help, his current attempt to find love has been sadly derailed. Indeed, it’s even been infused with misfortune but, if we're honest, selecting a piece of fruit as a potential mate may have been ill conceived from the off. One can only hope that, in his future adventures, Karl has the resilience and considered judgement to find good in the world. Go Karl, you got this! The aroma of his latest mishap is almost lemon Eno-like, but in a good way, with a slight herbal note. 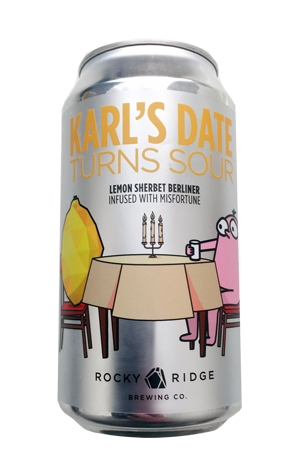 Fruity lemon fizz carries through on the palate with a zippy yet moderate lactic acidity and similar level of carbonation.